With the move to Visual Studio with the release of Microsoft Dynamics AX 7, the debugging experience also moved to use the standard Visual Studio debugger. That means that we get some goodies that were previously not available in the MorphX debugger. One example of that is the Immediate Window, which allows you to write expressions that are evaluated in the context of the currently hit breakpoint in X++ code. This basically gives you the ability to call methods, look up variable values, ultimately allowing to change the current state. That is obviously a very useful feature. Unfortunately, the current version does not fully support X++, meaning there are certain quirks when it comes to using it. 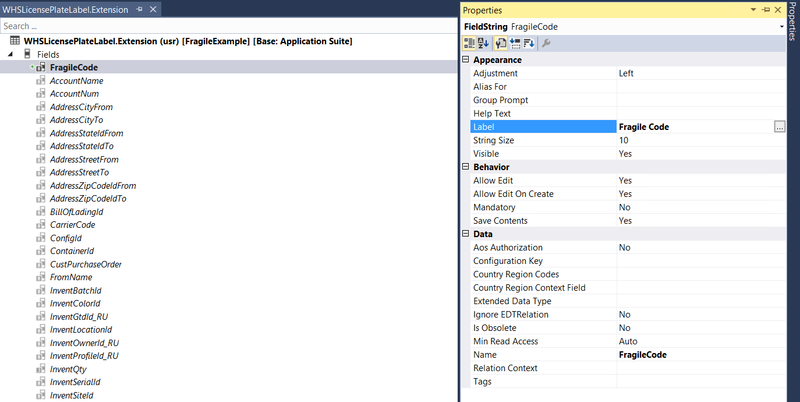 In this post I will describe the capabilities and syntax you need to use, so you can overcome some of the learning curve that comes with the new debugger. There is no native support for X++, so you need to use C# syntax. Intellisense for X++ is not provided. This is a consequence of the way the expression evaluator works. X++ is case insensitive, while C# is not. This means that references made to identifiers need to be in the case that was used at the place of definition. The Expression evaluator has no knowledge of labels, so you will need to use workarounds, like SysLabel.labelId2String("@WHS1399"), if necessary. Now, with that out of the way, let's look at some examples. worKLine - as you can see, it's not a problem for the compiler, because X++ is not case sensitive, but it is a problem for the debugger, which is. So worKLine with capital K will not be recognized, while workLine will be treated just fine. This is the reason for one of the most confusing moments with the new debugger - hovering over the worKLine variable in the code editor will not show its value, even though everything looks fine and compiles. Finally, success, we use the right record variable name and the right field name - so we got our result, the value of that field in the current record. We are trying to invoke a method which resides on the Global class exactly the same way it is done in the code we are debugging, but that won't work, the method is not recognized. Microsoft.Dynamics.Ax.Xpp contains a number of helpful classes to compensate for lack of full X++ support. TrueFalseHelper is one of them, and its method TrueFalse() will use the X++ logic for evaluating if an expression is true or false. We use it here and pass in the record buffer. It returns true, because the record has been selected. In real C# that would fail, as the record cannot be implicitly converted to bool, along with most other X++ types, like str, integer, etc. Yet another example is the PredefinedFunctions class. You can see all the available methods in the Appendix. Here we invoke the tableName2Id(), passing in the string containing WHSWorkLine. Remember 'single quotes' do not work, only "double quotes". In this case all looks good, but the function is not recognized. That's again because of the casing. This class is very inconsistent about the casing of its methods - so you just have to remember the ones you commonly use, or use the robust "trial-and-error" approach. Locals window, which is similar to the Watch window, but shows the values for all local variables without you first adding them to the list. The Breakpoints window shows all of your breakpoints, and you can for each one decide to configure it further, disable it or remove it. You can now make the breakpoints conditional, however since it uses the same Expression evaluator, I had trouble with it, so I stopped using it after a while. The counter condition works fine though, so you can use that in various complex loops and stuff, setting the breakpoint inside the loop. Autos window, which is supposed to show the current line variables plus any from the previous line is useful, because it shows the global state variables on top of that, ttslevel in particular. Company, Partition and UserId are of lower interest. Watch window - that's as expected, you add variables, their values are shown and can be edited on the fly. Note all the above restrictions apply here as well, so watch the casing and syntax. 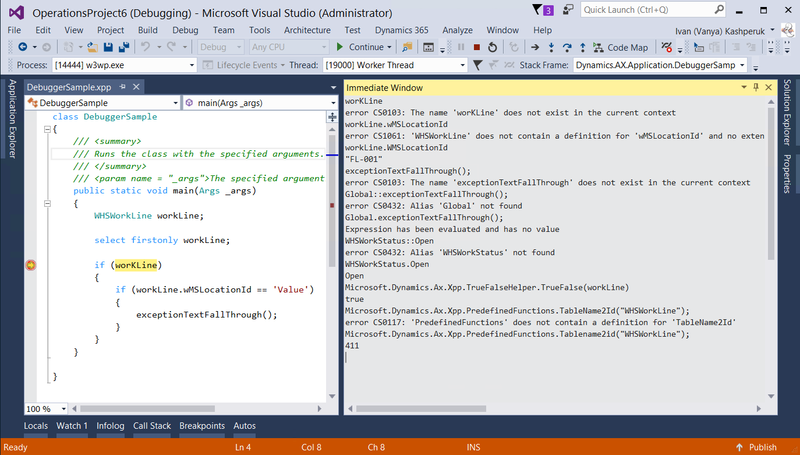 As you can see, the Visual Studio debugger is much more powerful than what we had in AX 2012 and prior, however it also has a number of limitations due to lack of support for X++ language. Note, that it's not just X++, other languages which you can use in VS also have problems here and there. Let me know how you find the new debugger. What features do you like? Something you miss from the old days? 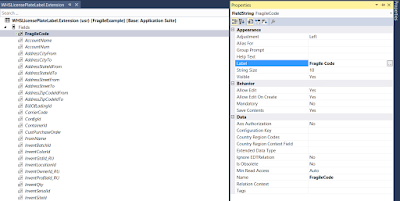 This appendix lists the predefined functions in the Microsoft.Dynamics.Ax.Xpp.PredefinedFunctions class. Pay special attention to the casing for the below methods. Note. The methods starting with q deal with containers. 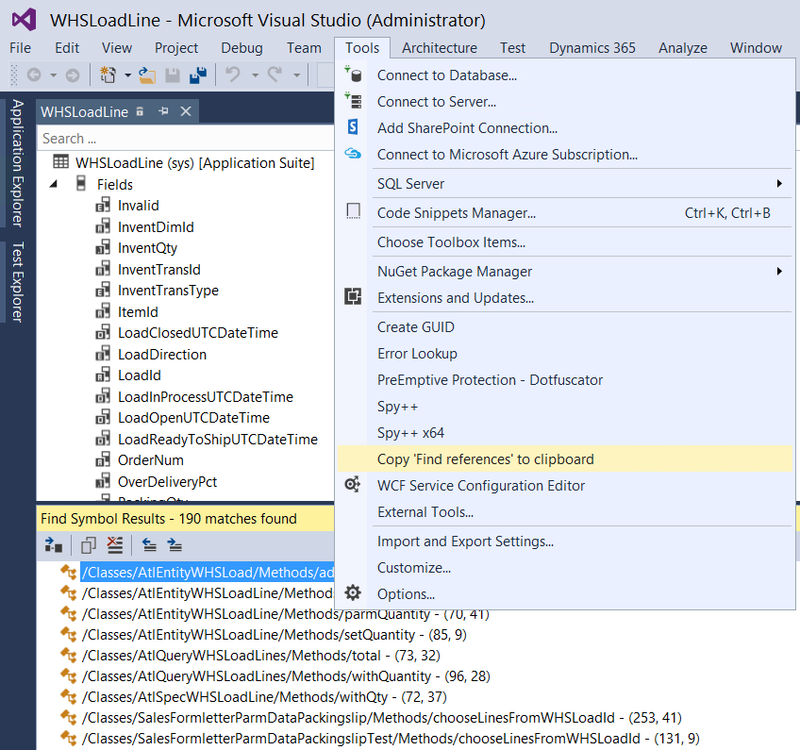 With the release of Microsoft Dynamics AX 7 the development moved to the Visual Studio environment. 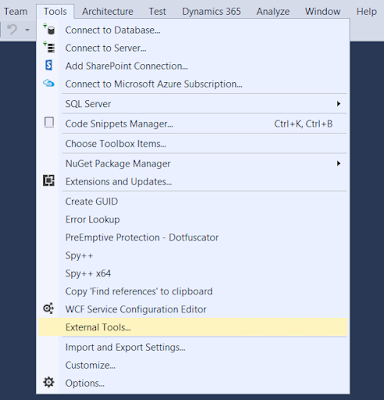 This had a lot of advantages, like the ability to use any 3rd party add-ons of various sort (which we actually have not seen that many of being applied to AX so far), all the VS goodies that come out of the box, a more familiar IDE for new developers, etc. But it also has its disadvantages, like the Cross-References display window. First of all, the indicator of whether a particular reference is writing or reading is gone. And we now display the xRefs using the standard Visual Studio "Find Symbols Results" window, which has one huge drawback as well - no way to filter on the data displayed, or copy that data somewhere else to do that. I was bothered by this lack of functionality for a while, so I went out to find if there's an existing solution. I came across this post, which seems like a sufficient solution for the problem, in my opinion. Kudos to the author! I have modified the project a bit to better suite AX needs, as I planned to browse the data in Excel, which has rich filtering capabilities and more convenience in navigation, and uploaded it to GitHub so anyone can use and extend it. 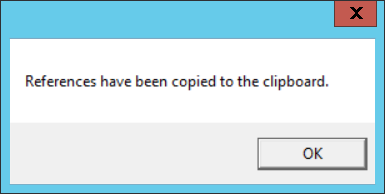 You can also just download the executable, if are OK with the out-of-the-box functionality I will describe below. Once you have the executable, place it in a folder on your environment running Visual Studio for AX, say, C:\Tools or whatever you prefer. Now add a new tool by clicking Add, and specify the Title, Command and Initial directory. Using the tool is very simple. Say I wanted to find all references to the WHSLoadLine.Qty field. 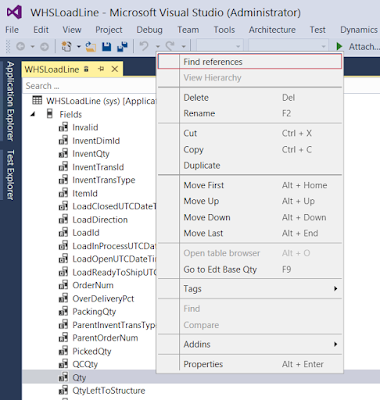 I would navigate to that field and select Find references from the context menu. This would bring up the standard Visual Studio dockable window Find Symbol Results, containing all the references to the selected table field. After a few seconds you will get a message box to pop up telling you the references have been copied to clipboard successfully, which means you can now to and paste the data to Microsoft Excel. Note. 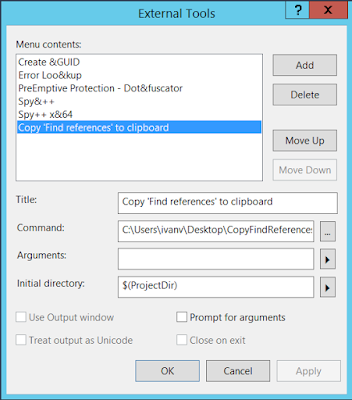 Since the tool uses UI-level automation to copy the cross-references, the Find references window needs to be open and visible for the tool to work. Now, you can do whatever you want with that data in Excel. 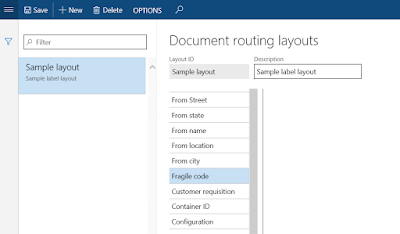 Today I would like to shed a bit more light onto how to extend the label printing functionality, specifically, show how to add a new field from the work line to be displayed on the label. This is something we have created as a demo for Tech Conf a while back, and you can still see the recording where Per and Zach from our team showcases the different label printing scenarios. You can view the different Microsoft conference videos here. 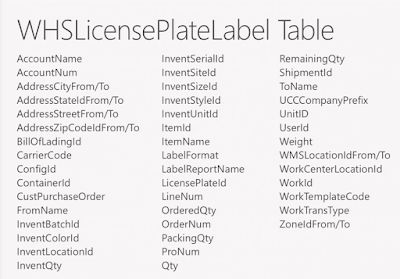 WHSLicensePlateLabel table, which contains the information for the label, which is substituted into the label through the variables. WHSLicensePlateLabelBuild class, which is responsible for populating the WHSLicensePlateLabel table with data for a particular work order (line). 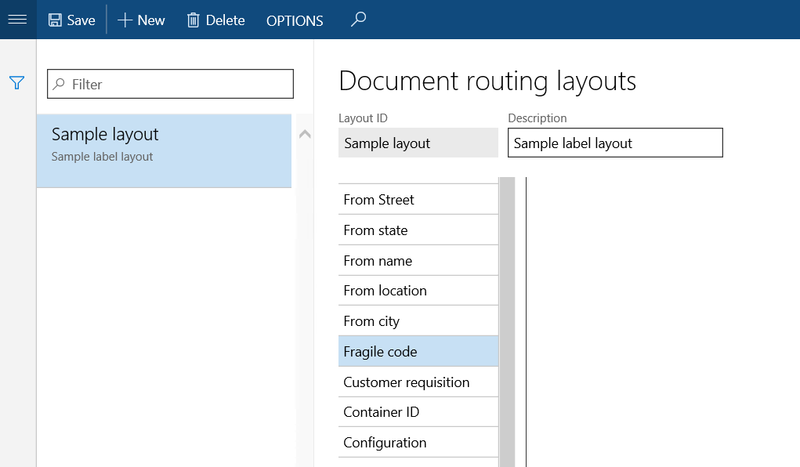 printDocument() method finds the specific document routing record that matches the flow criteria (e.g., warehouse, work order type, carrier, etc. ), performs the translation of the label and sends it to the selected printer (Note that the label can be printed to multiple printers and you can for each printer decide, which layout to use). 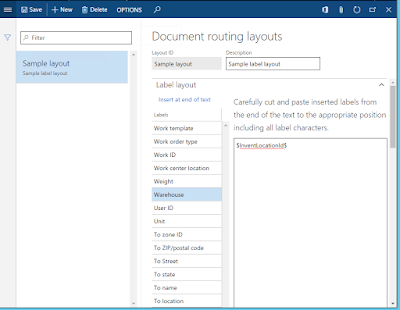 These fields represent the full list of potential variables that can be put into the label in the Document Routing layout. Depending on the item flow, some of these fields are not populated. 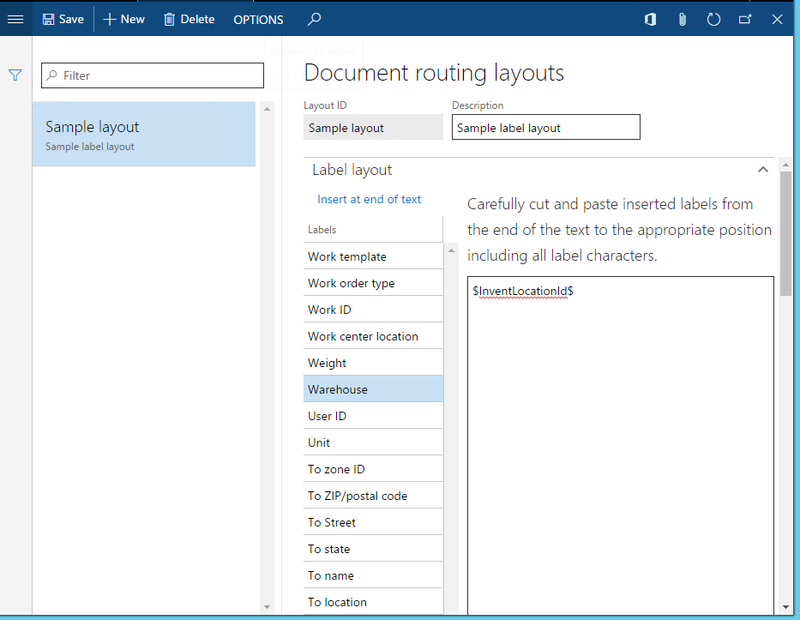 Note that when setting up the placeholders in the Document Routing Layout form, only visible fields are displayed. That allows for storing some "plumbing" information for each record, like the PrinterSettings. For some scenarios you might want to display some additional fields on the label, which are not part of the list shown above. 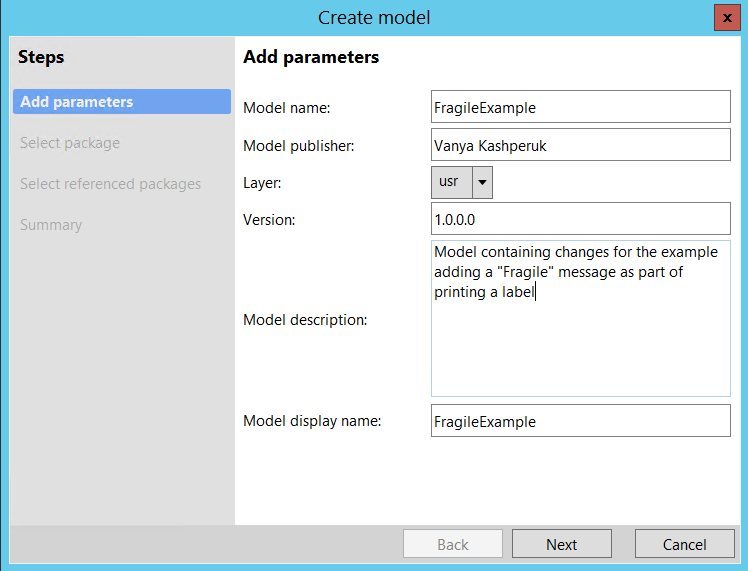 Imagine a scenario where we want to display a "Fragile" message on the label if the items on the work line are accordingly marked. Since there is no such field in the label, we will need to extend this functionality. And because we are working in AX 7, we will try to use Extension instead of Overlayering the elements, as we would do in AX 2012 R3. First of all, let's create a new model, which will contain all the elements we add through extension. We will put this model into a new package, as we do not intent to overlayer existing AOT elements. 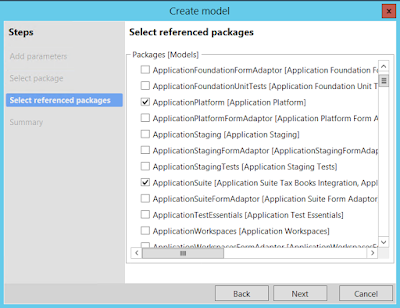 We will reference the Application Suite package, so that we can access the elements defined in it, such as the ones mentioned above. 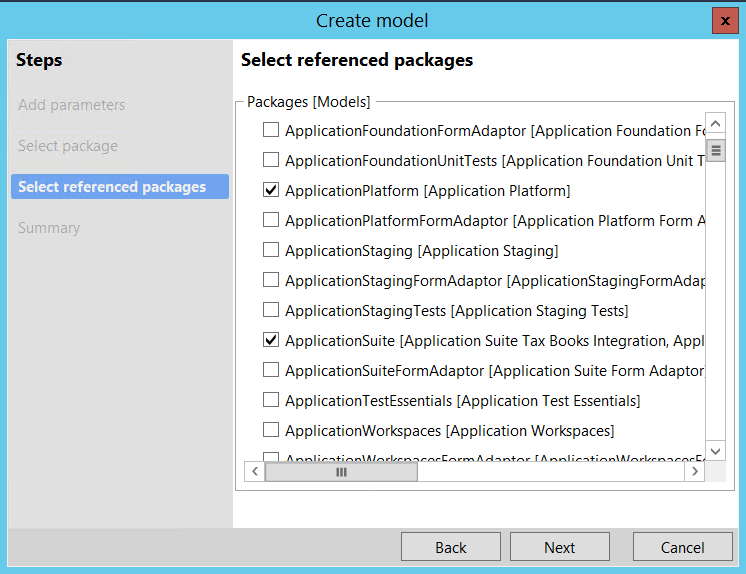 Note that by default the new package will also reference Application Platform. Confirm the creation of the new model and create a new project for it. Name it FragileExample. 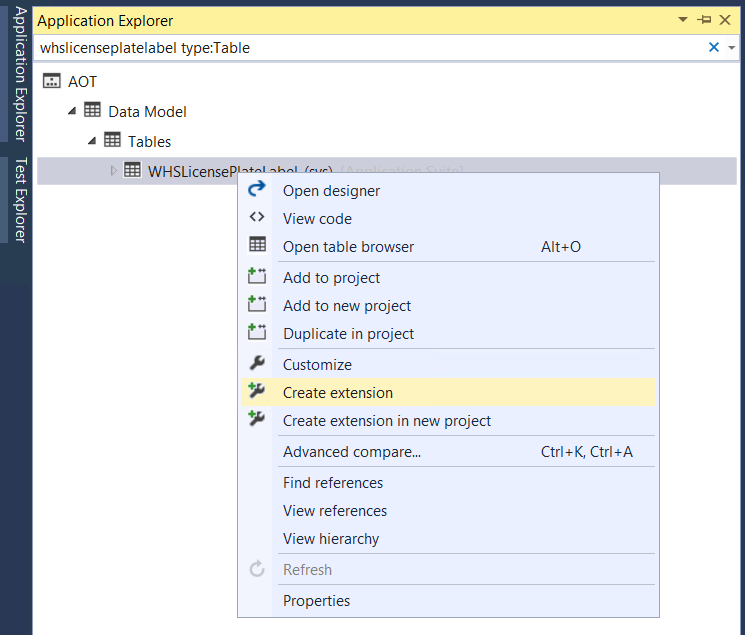 You need to have selected the right project in your Solution Explorer before you attempt creating an extension. This is to ensure that the extension is actually created in the right model. We are now going to add a new field of base type String, and call it FragileCode with the corresponding label. Now that we have the field available on the label, we need to populate it. 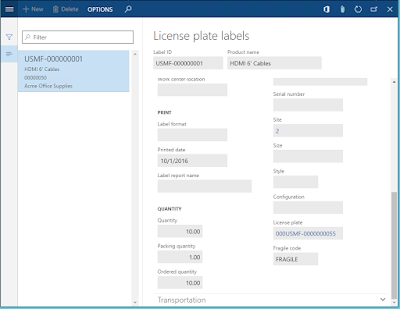 As you all know, any and all work creation and execution in Dynamics AX happens through the WHSWorkExecuteDisplay* classes, e.g., purchase order registration can execute WHSWorkExecuteDisplayPOItemReceiving, while general work execution flows can execute WHSWorkExecuteDisplayUserDirected, etc. Within these classes the WHSLicensePlateLabelBuild class is initialized, and the buildLicensePlateLabels() public method is called, when a label needs to be generated and printed. 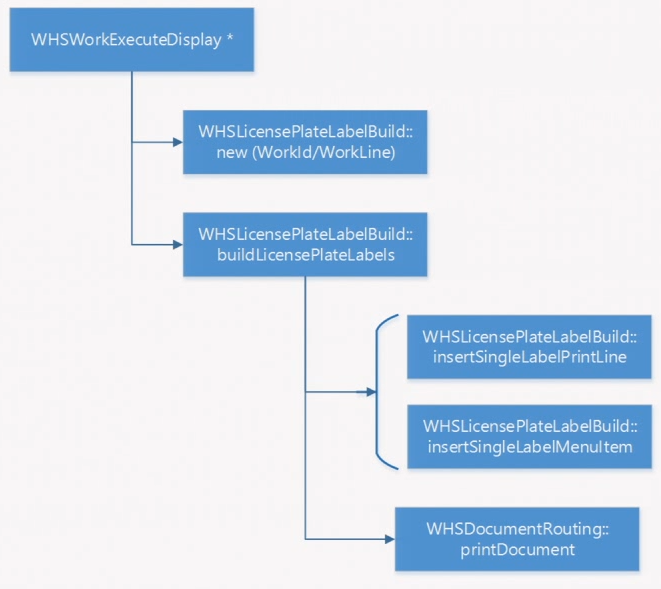 Depending on the flow, either the insertSingleLabelPrintLine or the insertSingleLabelMenuItem method will be invoked internally, after which the generated label is printed through the printDocument API of the WHSDocumentRouting class, as described above. Note. 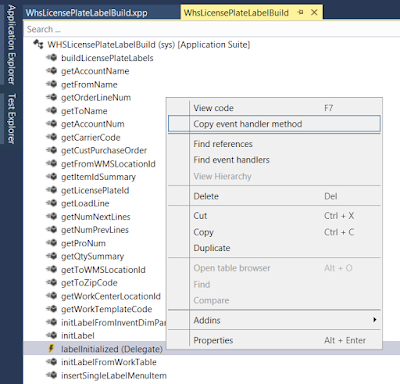 insertSingleLabelPrintLine supports the flow where the Print step is part of the work template lines, while insertSingleLabelMenuItem is for the case, where the Print is configured through the mobile device menu item. So, in order for us to populate the extra new field we need to look into these insert* methods. 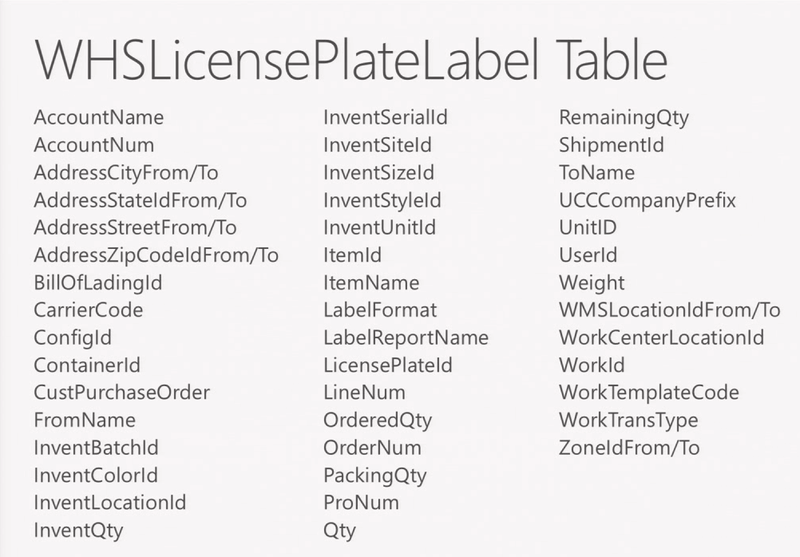 With the recent AX 2012 R3 changes these methods have been refactored in a way, where most of the logic for populating the WHSLicensePlateLabel table has been pulled out into a new private initLabel() method. 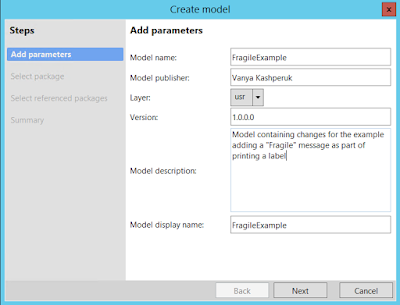 This is awesome and is one of the new extensibility language features in Dynamics AX 7 - I have subscribed to the event of this method being called without touching the original class at all. As you can see, instead I have a SubscribesTo attribute that subscribes me to the corresponding event in a static fashion. As you see above, the code is super simple, all we do is get the Filter code value from the corresponding item, and populate it into the FragileCode field. Let's now compile everything and give it a go in AX web client. You can download the VS project file from my OneDrive here. Modify the Mobile device menu item for Purchase receipt to "Print label"
Depending on your label layout you would have this message printed on the label as well. 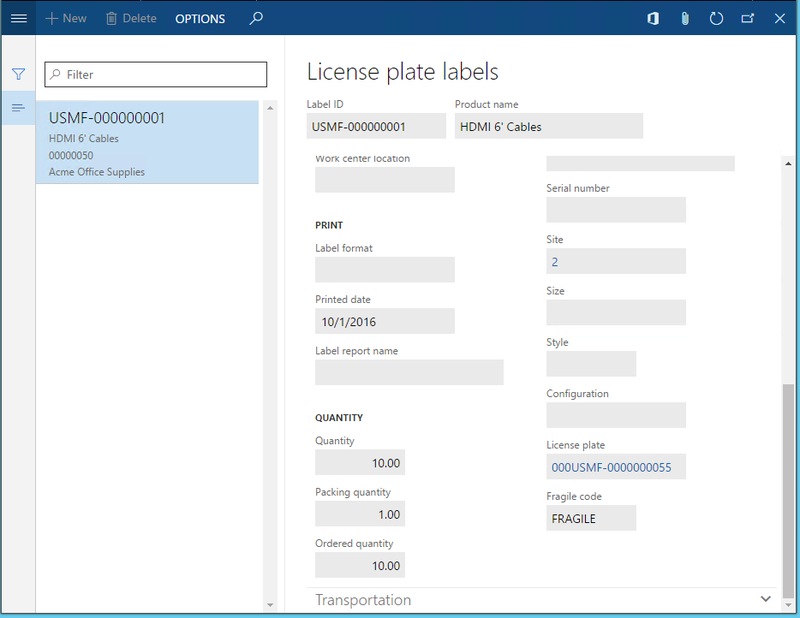 With this blog post I hoped to show you how to extend the existing set of fields available on the license plate labels. At the same time we took a look at some of the new language constructs, design paradigms and tooling that allows for a much cleaner approach to extending existing functionality, as compared to overlayering, which many are used to. Consider extending instead of overlayering next time you need to make a change! With the release of Microsoft Dynamics AX 7 and the move to the Cloud, printing has become a bit more complicated than before, since the printers are not on the same domain / network as it used to be when everything was installed on-premise. The major change that I will talk about in this post is the way we set up printers now. For example, one of the unexpected requirements is that Adobe Acrobat Reader is installed. Now that the document routing agent application / service is installed and can sign in to AX, you can select the printers you want to expose, activate them in the Network printers form, as described in the above wiki article. After that, they will show up in the Printer name lookup on the Document Routing form as before. Everything else is pretty much the same from a user standpoint, nothing changed in terms of document routing configuration or the WMDP configuration. The Document Routing Agent application / service on the network printer server or just as a local application one of the network PCs will periodically query if there are any pending files to be printed, downloads them from the Azure Blob storage and, depending on the printer settings defined for the specific file, re-routes the file to be printed, whether that is to a Zebra printer, or, in the case of regular SSRS reports, to a PDF document, or a regular printer. Give it a try and report back here in case you find some of the instructions unclear, or if something is not working according to your expectations. On Wednesday, July 6 we announced Microsoft Dynamics 365, the next generation of intelligent business applications in the cloud. Now it is time for the Dynamics 365 public launch event. Join online on Tuesday, October 11 at 11:30 AM Pacific Time (UTC-7) and be among the first to see our next generation of business applications—helping your organization to grow, adapt, and evolve.